If you have facial redness that worsens with heat, alcohol intake, or emotional upset, you may be one of the 16 million Americans who suffer from the skin condition called rosacea. Your board-certified dermatologists and physician assistant at Genesis Dermatology in Jupiter, Florida, have many years of experience in treating rosacea and would like to explain more about the potential causes and treatments. The telltale symptom of rosacea (pronounced “roe-ZAY-she-uh”) is an intermittent sudden flushing on the cheeks and nose but can include the ears, forehead, chin, neck, or/and the chest. Often times a series of bumps on the face that resembles acne are present as well. Other less common symptoms include stinging, itching, or a burning feeling on the skin. Patches of rough, dry skin and vision problems can occur as well. Although rosacea can come and go, persistent symptoms can lead to other longer-lasting effects such as enlarged or broken blood vessels on the face, generalized facial redness, enlarged pores, and rarely a bulb-shaped nose due to skin thickening in this area. About half of the people who have rosacea also experience eye problems including dryness, redness, irritation, and swollen eyelids. The problem with rosacea is that the exact cause is unknown. We do know that rosacea tends to run in families and light skin, blonde hair, and blue-eyed individuals are more likely to have the condition, though it can affect anyone. Typical onset is between the ages of 30 and 50. Women tend to be affected more often than men, but men are more likely to experience the nose enlargement in later years. Having a history of severe acne, smoking, and persistent sun exposure increases the likelihood of the disease. Some theories as to the cause are genetics, prior sun damage, and an excess of bacteria (H. pylori). Another theory is an unexplained proliferation of the normally harmless microscopic mites (Demodex ffolliculorum) that live naturally on the skin. 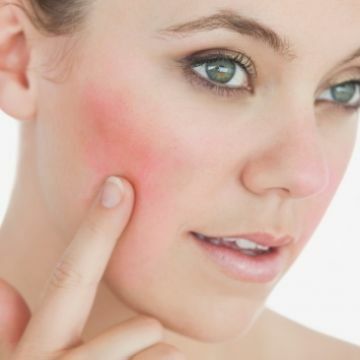 However since the cause of rosacea is unknown, there is no cure for this condition. Many ways to minimize the symptoms associated with the condition have been discovered. These include topical creams such as metronidazole and ivermectin, an oral antibiotic such as doxycycline, and sulfa based cleansers that help control the skin bacteria and associated inflammation. Topical creams such as Brimonidine gel have shown effectiveness in reducing redness by constricting surface blood vessels. Various light devices and lasers have been developed to help control flushing and reduce enlarged blood vessels. Prevention, as is the case with so many health issues, is the key to controlling rosacea. Eliminating triggers like extreme temperatures, hot/spicy food, alcohol intake, sauna use, extreme wind, and sun exposure can help. Some medications such as steroids or blood pressure medicine can also trigger the condition. Avoiding these known triggers can go a long way toward preventing flare-ups. In addition, proper skin care has a significant impact as well. Use gentle cleansers and moisturizers that do not contain alcohol, witch hazel, alpha hydroxyl compounds, or any other ingredients that have been known to irritate sensitive skin. Wash and dry the skin gently. Most importantly ALWAYS wear a sunscreen with at least a 30 SPF daily and reapply often when in direct sun exposure. If you think you may have rosacea, let us evaluate your symptoms and help plan an approach to minimize them.